- Chickpea, a natural source of proteins, effectively nourishes hair, making it healthy and shiny. 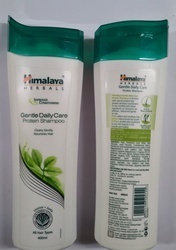 We are one of the reliable organizations in this domain and are involved in providing a supreme quality range of Himalaya Baby Shampoo to clients. This Himalaya Baby Shampoo improves shine and luster of your baby’s hair. Besides, these products leave a fresh fragrance on the skin and are reasonably priced.
. • Effectively attacks root cause of dandruff. • Gentle on hair and scalp.